I scream, u scream, we all scream for ice cream! Having children has made me quite the aficionado of ice cream....and where to find the inexpensive stuff! Here in the Double C we have a pretty fine selection. So lets start with one of the best and incredibly delicious. It was brought to my attention by my thrifty friend Jack, father of 3. Rite Aid next to Pavillions on Jefferson/Sepulveda intersection has a seriously fabulous ice cream bar within the store, called Thrifty. They have traditional, old school flavors. Hello rum raisin and butter pecan. (I spent many years in Oklahoma indulging in Swensen's & .... ice cream shops....heaven) They give you huge scoops that are made into long cylinder shapes and they only charge you $2.17 per scoop. You can have fabulous waffle cones as well and the people who work there are really friendly. Just around the corner is Blanco park, so saunter down the street and enjoy your cheap yet delicious indulgence. Menchies is about 100 yards away from Rite Aid on Sawtelle just below Sepulveda. This place is hands down my favorite. They have at least 20 flavors of amazing frozen yoghurt, a bar full of fruit, cookie, mochi and brownie toppings plus a whole area of containers full of coconut, carob chips, gummy bears, heath bar and kit kats broken up into little pieces. They also have big bottles of liquid marshmallow, peanut butter and hot fudge sauces. They weigh your container and you pay by the ounce. You can load up on fruit, ice cream and goodies and it will barely cost $3.50. Everyone who works there is extremely friendly and they have a frequent flyer program and stickers to give out. Plus, they have a back room that you can rent out for birthday party. Ice cream binging anyone? We are also getting another Menchies in downtown Culver City soon. They recently redid the whole restaurant and you can have the gelato served to you on the front patio or take it to go in their adorable italian plastic bowls. I highly recommend going there after dinner, getting a scoop and sauntering around downtown taking in the wonderful atmosphere. On the up and coming east side of Culver City, amongst all the great art galleries on Washington Blvd., is an awesome new kid in town, Coolhaus. The flavor selection is out of sight: double chocolate with sea salt, potato chip and butterscotch, vegan truffle banana, gluten free coconut almond, ginger molasses, and so on and so on. So! You choose a divine cookie and get a wedge of yummy creaminess in between your cookies. Sit in the storefront, on the sidewalk or saunter up and down Washington Blvd and gaze into all the wonderful storefronts. You may recognize the name after seeing Coolhaus vans driving around LA, parking and selling at festivals, museums, farmers markets and more. Two gals starting the food truck part and have now expanded to other cities. But Culver City is the only place where they have an actual storefront and you can select your own, at the corner of Washington and Cattaraugus. It is such a cool experience plus they sell delicious coffee that I highly recommend making into a coffee and ice cream float. Heaven! 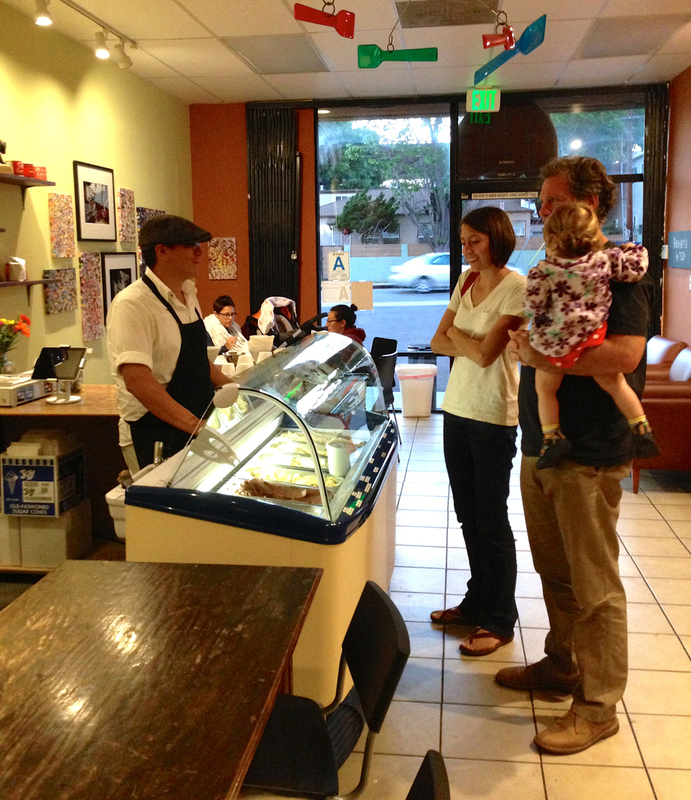 Just beyond the outskirts of Culver City is a little gem called Scoops. It is in a mini strip mall on overland and woodbine (just north of Palms). They have the most amazing creativity when it comes to flavors. Lemon butterfinger, apple pie, ricotta honey m&m, almond green tea and malt brownies to name just a few. They also have a huge selection of non dairy: peanut butter molasses, peach blood orange sorbet, banana oreo and pistachio rosewater, etc. 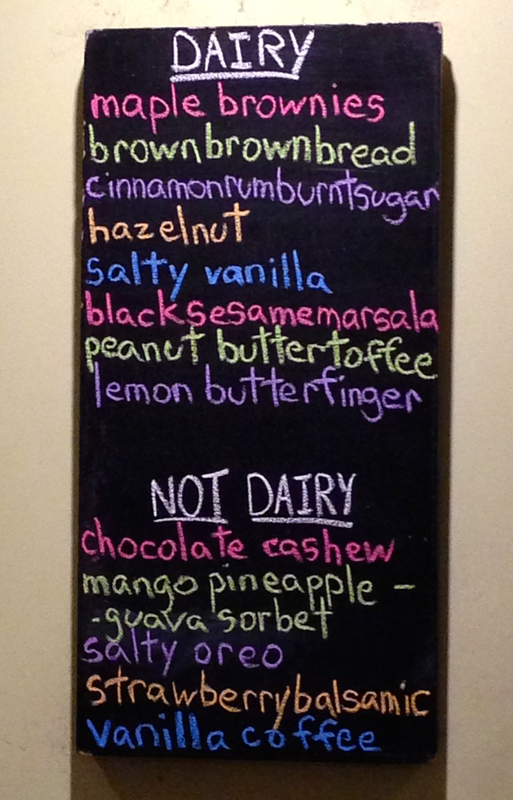 They change their flavors daily and you can follow them on facebook and twitter to see their offerings. Very cool. They also serve individually brewed specialty coffees. This place is so cool they even have art gallery showings some nights: new artist + gorgeous iced goodies = great experience in Culver City. Posted on October 15, 2013 by Douglas Hunter. I love that gastropubs have hit Culver City with full force. Theres an everyman feel to them. Not too fancy but the food is really interesting. Beer, but really eclectic beer. Modern and creative dining rooms, but not stuffy and off putting. Anyone from any walk of life is welcome, even kids. And now, we have a big selection to choose from. Father's Office, Ford's Filling Station, Public School, City Tavern, and Rush Street. Rush Street on Culver Blvd was the first to roll into town. Right in the middle of downtown Culver and located next to the Fire Station, it is a restaurant of many faces. This is a happening lunch place with a huge front patio where you can soak in all the passers by under the protection of umbrellas and, if needed, heat lamps. Inside the dining room is huge. A long inviting bar, large raised u shaped banquettes, square tables in the front and tall bar tables in the middle. Something for everyone, young and old. They have TV screens displaying sporting events all day, but they are not invasive. Then there is an upper deck that has a big lounge area with comfy couches, low tables and ottomans which heats up in the evening and becomes a really cool bar. My gal pals and I go there sometimes and have a great time. Really amazing atmosphere. The lounge has another bar that leads off it into an outdoor deck that gets super cool and clubby at night. The crowd is very diverse and eclectic. Everyone is welcome and you don't feel old if you aren't 25. It's a comfortable mix. Food: The truffle fries are to die for. You must get them. I love lots of the appetizers - loved the tapenade plate - something for everyone and my whole family devoured it. I loved the lamb burger as do a lot of my friends. The flat ironed steak was really well done as was the blackened salmon. A full bar with an eclectic beer and cocktails menu is guaranteed to set you up for a good evening. From Yelp: "Met some friends for an all american meal and wasn't disappointed. Portions and price were perfect (big portions - reasonable price)." www.rushstreetculvercity.com They are open every day for lunch and dinner. City Tavern, a little further west, close to the Kirk Douglas Theater but still in the downtown hub, is about 2 yrs. old. This is a gorgeous space. Really creative minds went into this space. They have ever changing beers, on tap, at your table. You can just keep topping up without ever having to leave your booth. They also have a lovely thriving patio and is great for people watching as it is surrounded by other fun restaurant patios. They have a really beautiful bar at the entrance and raised communal bar tables at the front. Every table has a great view and its fun to soak in the atmosphere. Their menu is really interesting and quite delicious. Their charcuterie platter, cheese plate and grilled crudités are gorgeous and plentiful - a real treat. Standouts were the pub burger and the fried chicken burger. My family loved sharing the jidori chicken as well as the pear salad. The rustic apple tart was pretty fabulous, too. From Yelp: "Great and imaginative comfort food plus a great draft beer selection." www. citytavernculvercity.com They are open every day for lunch and dinner. Ford's Filling Station is solidly one of my families favorite places. It is very cool, chic and always superb food. 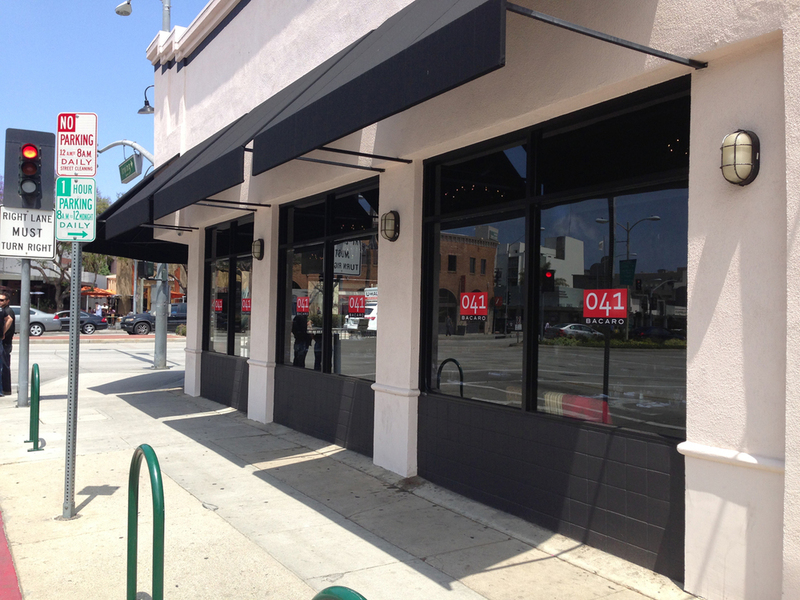 It is right in the heart of downtown Culver City, next to Tender Greens and Akasha. The patio is in the front and the side and is heaven for people watching. The dining room is warm and lively with an amazing atmosphere. I have never had a bad meal here and am always blown away by the food. The waitstaff and hostesses are always friendly, cool and very knowledgable. The bar area is very inviting and the mixologist creates eclectic cocktails. They always have an amazing array of daily specials and we usually choose from them. They have a terrific assortment of charcuterie and cheeses. I love the duck proscuitto salad and the flatbread pizzas are superb: the squash blossom with leeks and fontina was fabulous. The fish and chips is one of the best in town - it comes with onion rings! - and the shephard's pie with lamb is wonderful. It is very chic comfort food. I highly recommend the brunch - an amazing brioche french toast, mixed berry compote and creme fraiche was devoured by us all. 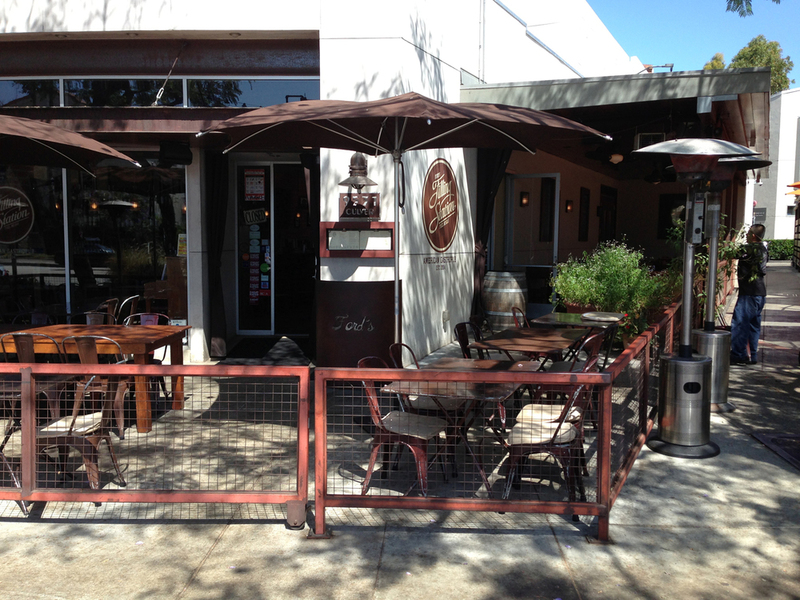 From Yelp: "Great food...wine... lovely outdoor seating." www.fordsfillingstation.net They are open every day for lunch and dinner. Public School is kinda one of my new favs. It is about a year old taking over the famed Fraiche space. I loved that restaurant and was really bummed to see it go. They have revamped the dining room into a fascinating place and it is always packed. Seriously, always! When you eat and drink there you know why. The waiters are extremely friendly and extremely knowledgeable. I recommend starting with the house made gin and tonic. Absolutely delicious. Ok, I had two! You must get the bacon cheddar tater tots (we go two of those also!) and the caeser was delish with kale - a light spicy kick, which is unusual. The fish and chips were light and tasty. We ate lots of appetizers there one night - the speck and eggs was great and we devoured the cauliflower gratin. They also have great sandwiches and great thin crispy flatbread pizzas. From Yelp: "The place is nice, newer, with a great patio, was crowded for lunch, and the service was friendly and efficient." www.publicschool310.com They are open every day for lunch and dinner. Father's Office is quite an experience. You just can't take your kids. It is a strict 21 and older hangout. But the food is amazing. They are right next door to HD Buttercup in the amazing Helms Bakery shopping area. They have a long and inviting outside patio. Inside is lots of dark and intimate tables. This place is full of cool, hipster atmosphere but everyone is welcome. The bar runs the length of the joint and you order your food and drinks there. Tables are first come, first basis. They have an amazing selection of spirits, beers on tap and a superb wine collection. But the food is amazing! First and foremost, their burger. Amazing piece of meat, gruyere, carmelized onions, maytag blue cheese and arugula! It's simply delicious and everyone I know agrees. Sweet potato fries are gorgeous too. I loved the steak au poivre and frites - amazing. I gotta be honest with you, I get the same thing every time, its that good. Just know that they are not open to changes or substitutions so don't go if you are super picky. But it is a great place. From Yelp: "Yeah, I know everyone says it. But, it does kind of seem to be the best burger in Los Angeles." They are open for lunch on Friday, Saturday and Sundays and for dinner every night. 041 Bacaro is small, intimate and incredibly good. Located right in the heart of the action in the old Santa Maria BBQ place, this is authentic Venetian fare. The waiters are lively and friendly and the food superb. My lovely friend Meta went with her husband and 3 yr. old and said it was “soooooo good. Really authentic, really rich with smaller portions that are just the right amount. The pappardelle with mushrooms was amazing and the fried goat cheese appetizer was super. It was like being in Venice without having to travel.” Yes please, sign me up. The crowd is a mix of real foodies and lots of families with everyone being treated the same. They are open for lunch and dinner but are closed Sunday and Monday. Wildcraft Pizza - Downtown Culver. They serve woodfire sourdough pizza in a neopolitan style. Now let the record state that I do not like sourdough. But this pizza, I love! It is interesting, exciting, unusual, and most importantly, absolutely delicious. The atmosphere is amazing: high ceilings, super casual vibe, great music, really friendly waiters and a great selection of appetizers, salads, beer and wine. I had what was almost like a very chic taco pizza - it was incredible. My kids loved the OG pizza - simple but full of wonderful fresh flavors. Also the Carbonara pizza with lots of delicious bacon and an egg on top was a stand out. I loved appetizer of the Burratta with roasted grapes and moscato wine sauce and wafer thin toast. They have a wonderfully inviting patio in the front and it sits in the row that holds Lundeen's, City Tavern and Meet in Paris. They are open every day for lunch and dinner. 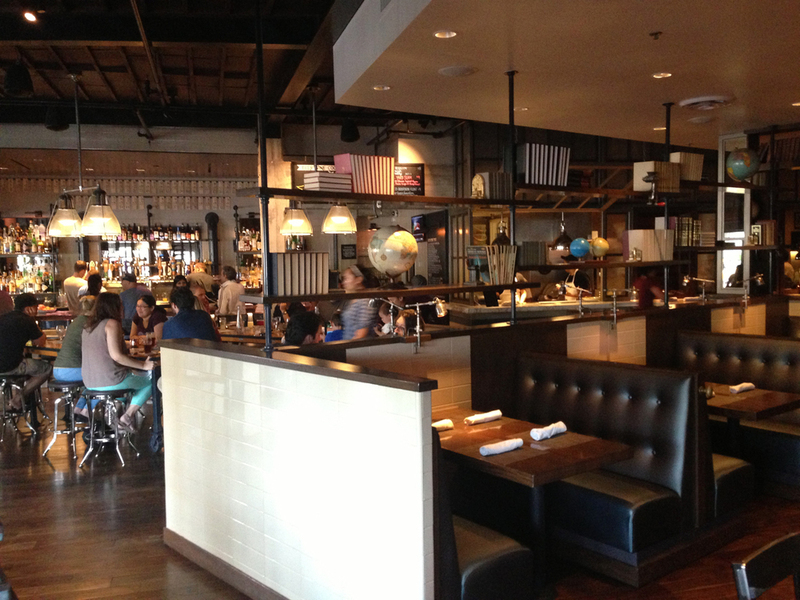 From Yelp: "The food was wonderful, the service was amazing, and the vibe was trendy, lively and fun. I also loved that we had the option of sitting outside or inside." Ugo - Downtown Culver, across the street from the movie theatre. There are actually two restaurants that have just been redone. It is prime real estate right in the heart of downtown and they have two fabulous patios to prove it. This is traditional delicious italian. I love the canneloni stuffed with spinach and ricotta. I am a sucker for ricotta. It is finished with a tart and sweet marinara. They have wonderful traditional sandwiches and great panini's. My mother always gets the chicken picatta and it is solid and hits that "comfort food" mark. We have always had a lovely meal there and you just can't beat the warm and festive atmosphere. Also, the gelato bar at the front restaurant is outstanding. They have an amazing selection as well as amazing italian pastries. You will definitely make this a regular place. From Yelp: "Their 4 cheese gnocchi is nothing short of heavenly!!" Pitfire Pizza - So full disclosure, this is my favorite place. It's the perfect storm of amazing atmosphere, super cool space, you see people you know and the burrata pie is heaven sent. Plus, they always have a DJ spinning classic tunes. I wish they could follow me around and be the soundtrack to my life. But that would be weird. And awkward. There is usually a line but it is absolutely worth the wait. (So get there early.) Their house salad is to die for. Burrata Pie - burrata cheese, tomato sauce, hazelnut, caramelized onion, wild arugula, and pesto drizzle - insanely good. The Heirloom tomato pizza with ricotta - amazing. Also the fold over chicken, four cheese and pesto pizza is ridiculously good and the kids mac and cheese and kids pizza - wonderful and very inexpensive. They have a really interesting wine and beer list. They have a huge specials menu that is ever-changing and very eclectic. Pitfire is located on Washington Boulevard (12924) near Waterloo and city and A-frame. On their website they claim it as Mar Vista. But we claim it as Culver City! From Yelp: "My family and I love love Pit Fire and all it has to offer. The food is amazing and the staff is so helpful and friendly. We have tried almost everything on the menu and nothing lets you down!!!" If you like authentic holes in the wall, Giovanni's Trattoria is an amazing find. Located in a strip mall at the corner of Venice and Clarington (kitty corner to Natalee Thai) is a wonderful authentic italian hang out. They do a big take out service but you can also eat in their small dining room where the owner is usually present. It is a wonderful little neighborhood restaurant. The minestrone is to die for, as is the chunky and divine bruschetta. My whole family loves the Chicken Milanese and orders it frequently - juicy tomatoes tossed in olive oil, basil and garlic atop a pounded and breaded chicken breast. I love their Penne Vodka and Rigatoni Bolognese. I do recommend getting more adventurous and trying their amazing specials. Portions are big and it makes it fun to get take out and curl up in front of the tv with an authentic and delicious italian feast. They are open every day from 5:30 PM to 10 PM and are also open for lunch during the week. 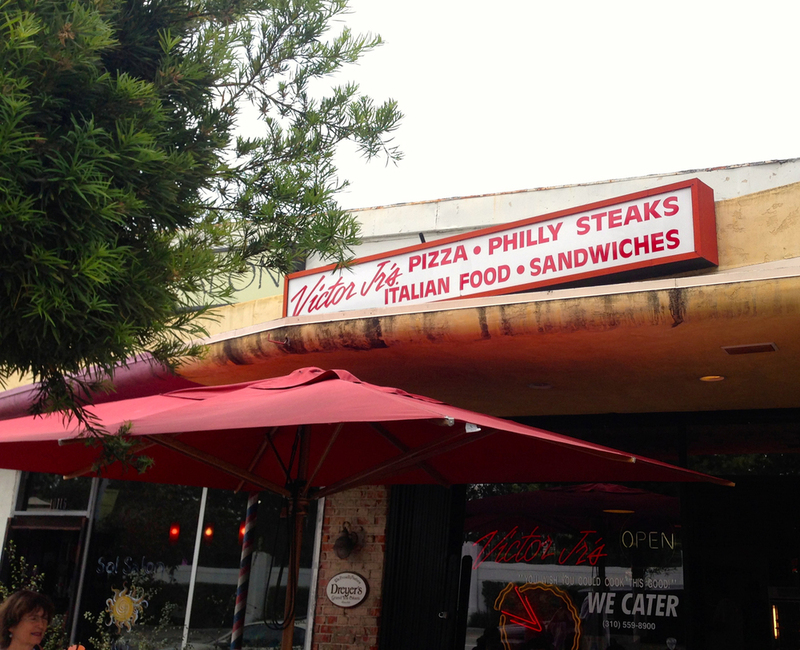 From Yelp: "My favorite Italian place in Culver City. The owners are Italian, and very friendly." On the east side of Culver sits a great neighborhood favorite, Brunello trattoria. 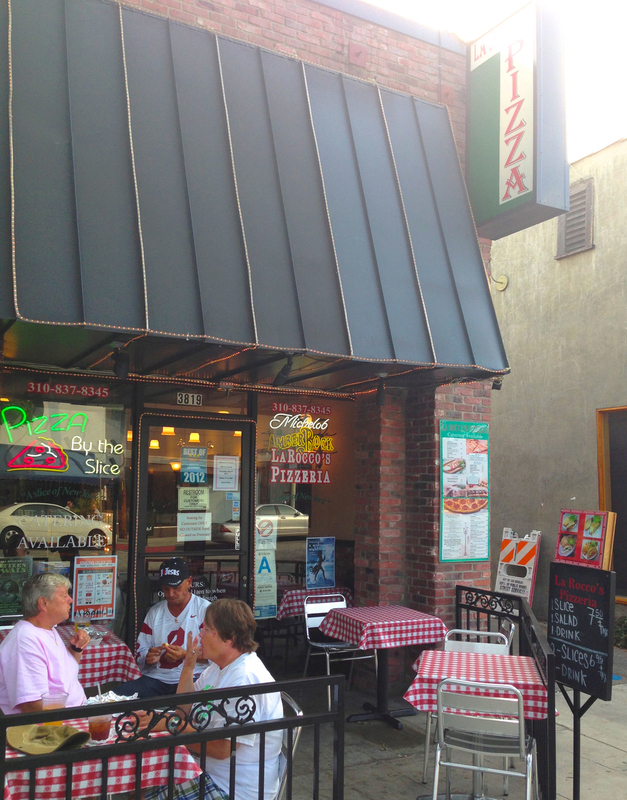 Located on the fabulous artsy stretch of Washington Blvd just west of La Cienega, this is a real regular haunt for many locals looking for authentic and delicious italian cuisine. I went there for a birthday lunch with my friends and family and was thoroughly impressed with how warm the owners and staff were and, of course, the food was divine. We have been back a few times since. I highly recommend the calamari app., as well as a really simple but beautiful penne with ricotta, eggplant, basil and tomatoes. I love their veal saltimbocca - tart but salty and sweet, it's a real indulgence and so so good. They have an outstanding specials menu that changes daily and is very exciting. If you want to drool and make yourself incredibly hungry, go to their website and look at the pics of food. Amazing. You will feel very much at home in the big, slightly noisy dining room - but the atmosphere is wonderful. And it's always fun to go for a stroll afterwards and take in all the galleries and groovy little shops along the way. Lunch & Dinner. 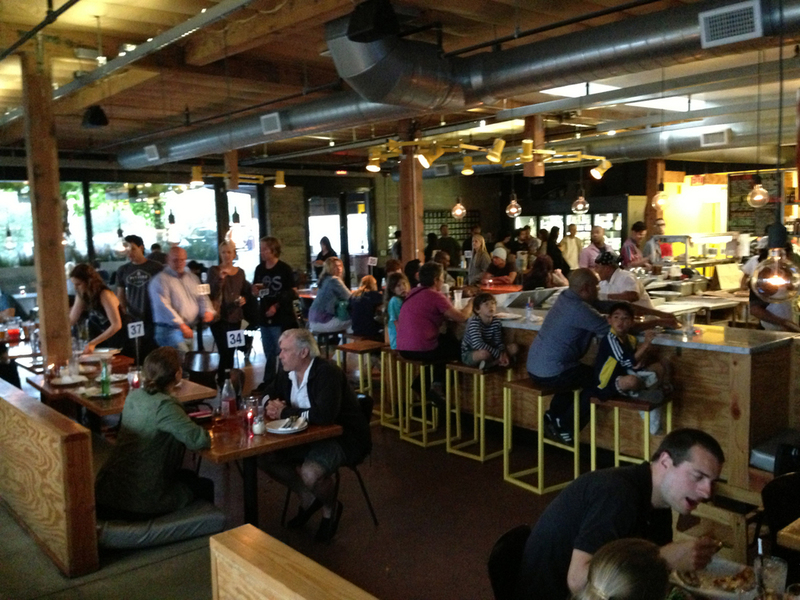 From Yelp: "The atmosphere is just right not too noisy and not too quiet. The food and wine is very good." An amazing little pizza delivery place is Victor Jr's Pizza on Washington just west of Madison/Clarington, across the street from Sony. They have classic and eclectic italian toppings for your pizza where most of your needs can be catered to. Their pies are huge and the crust is delicious. Every time I go in there to pick up my pizza, the guys behind the counter are extremely funny, friendly and charming - always a pleasure to chat with. Their sausage sandwiches are fab and tons of people crave their Philly Cheese Steak sandwiches. They have a cute front patio that is always busy at lunch time. They are open Monday thru Saturday from 10 am to 9 pm. From Yelp: "My wife told me she hates "HAWAIIAN PIZZA", but this was the best pizza she has ever had in her life." From Yelp: "Best NY Pizza in Los Angeles. GREAT PIZZA! GREAT BEER! GREAT PRICES!" Posted on June 11, 2013 by Douglas Hunter. I first heard about Culver City when I lived in another part of town from a friend. She said, “Oh, I do everything in Culver City. I just love it.” So off I went with my 3 year old in tow and proceeded to drive right through it without seeing a thing. What had I missed? I saw 12 car repair shops, a run down mexican restaurant and a closed italian restaurant in an, albeit, charming building...oh, and a Starbucks. I was not impressed. 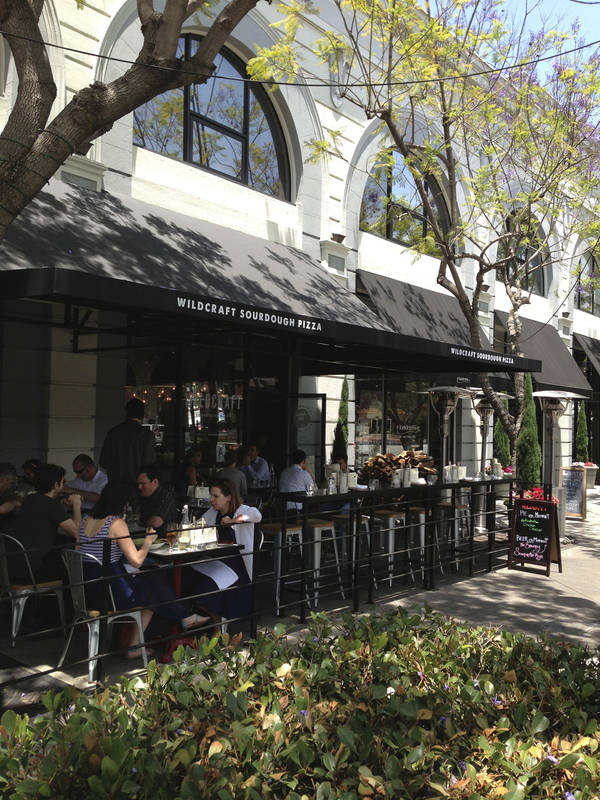 Cut to 3 years later and downtown Culver City is a foodie haven and destination for a lot of fun. Located right where Washington Blvd. meets Culver Blvd. 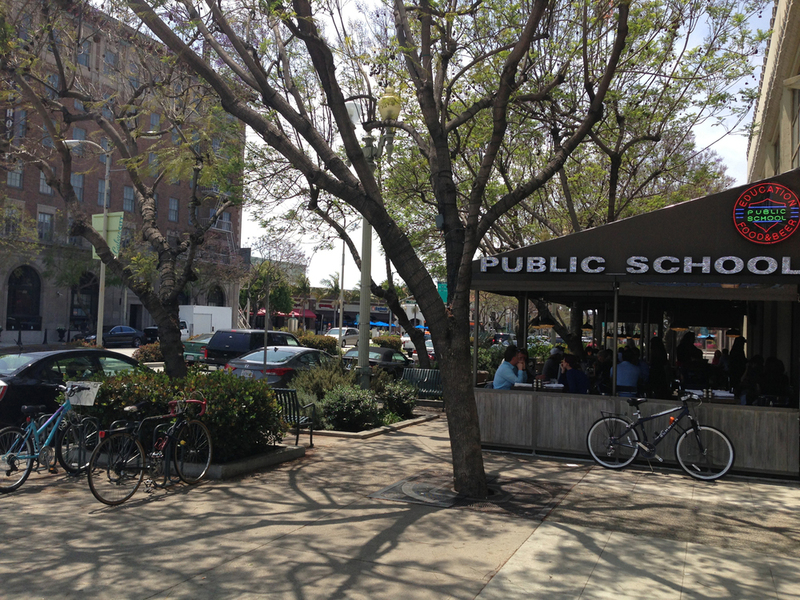 just below Venice Blvd., we now have a plethora of amazing places to eat. The lively atmosphere on any given night is electric and all ages and races are represented. It makes me so proud to live here and my family and I love just being downtown. One of the best nights I had was with a bunch of 9 years old having fabulous sushi at K-Zo and then skipping down Culver Blvd with all the twinkling Christmas lights and restaurants spilling over with people as we ended the evening at Ugo for gelato. Beyond fun for everyone....not just the kids!! We have gastropubs (ford's filling station, rush street, city tavern, public school), healthy hubs (lyfe, native foods, tender greens), healthy fast food (daphnes greek, chipotle, jersey mike's), ice cream (coldstone creamery, ugo, menchies) gourmet delights (akasha, fords filling station, meet in paris), sushi (kzo, sake house), coffee shops (starbucks, akasha cafe, l'epicerie, grand casino, s & w diner), bars (seventy 7 lounge, bottlerock, rocco's tavern, culver hotel lounge), mexican (kay n daves), pizza (larocca's, wildcraft) and a couple of really great lunch spots on main street - (lunch, libra brazilian). I'm telling you, you could wander around for weeks and try something new every night....and then go to the movies. Downtown Culver City is a charming place to hang out.